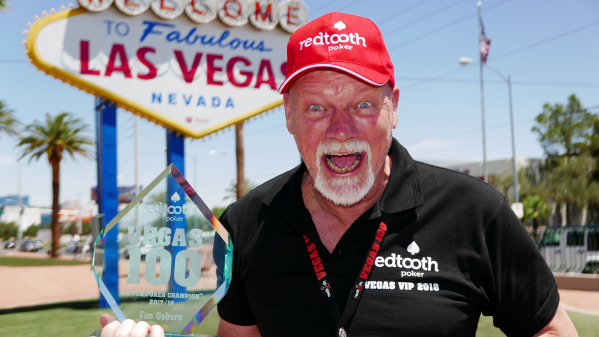 In 2012, Redtooth Poker revolutionised pub poker in the UK by introducing VEGAS100, a concept taking the UK’s top 100 poker players, which are found via regional, national and online qualifiers, to the poker capital of the world, Las Vegas, to join the VEGAS100 experience and compete for the title of UK Pub Poker Champion. 100 players would travel across the pond but only 1 would return as the champion. Birmingham’s Patrick Buchanan emerged victorious last year to become our 2nd consecutive West Midlands champion but would he hold onto his crown or would a new star emerge from the desert of Las Vegas? We kicked the tournament off on time as ‘shuffle up ‘n’ deal’ was announced at 12noon. With our VEGAS100 final offering an exceptional structure it took nearly 2 hours before we lost our first player. The VEGAS100 structure is designed to give all qualifiers a great Las Vegas poker playing experience, even for the first player out! The unlucky player on this occasion was Player of the Year nominee Andy Gove from the Catherine Wheel in Newbury. 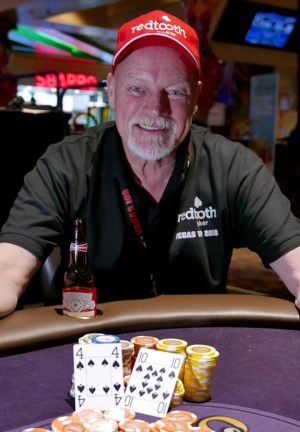 Andy departed our feature table and had a quick chat with Redtooth Poker’s Pete Thompson. Andy’s elimination triggered further eliminations with some surprise names falling early including last year’s UK Pub Poker Champion Patrick Buchanan (left) who fell in 74th position. 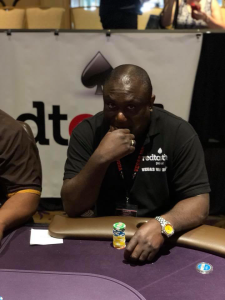 Patrick was full of confidence going into the final and was hoping to be the first ever back-to-back Redtooth Poker champion and this confidence was justified with a good showing in the welcome event by finishing in 19th position out of nearly 200 players. Unfortunately it wasn’t to be but one thing is for sure, Patrick will go down as one of our greatest ever champions and now holds the record for the most money won during his sponsorship year. Our Player of the Year nominees generally struggled on what was a tough day for the majority of them. However, Ron Simmons from the Queens Head in Gretna went on to hit the final table finishing in 7th position to take home £500. Unfortunately for Ron, the Player of the Year voting had already been completed before the final had started! Mike Yeo finished in 40th position with the 2017/18 RPT leaderboard winner Liam Hamilton being eliminated in 45th. Player of the Year winner Caroline Quinn had a tough day and finished in 92nd position. After around 9 hours of play we hit our final 20 players. Amongst them were our two remaining female players with Nottingham’s Josie Marston and Gloucester’s Diana John both hitting the final table with healthy stacks. However, it was Warrington’s Andrew Johnson who led the final 20 stacking around 295,000 chips. Our final two players playing the heads-up match was Tim Osborn from the New Club in Oxford and Eddie Hunt from the King Harold in Harold Wood. The battle lasted around 30 minutes and came to an end when we had an all-in from Tim Osborn and a call from Eddie Hunt on a 2c-10d-5s 4h board. 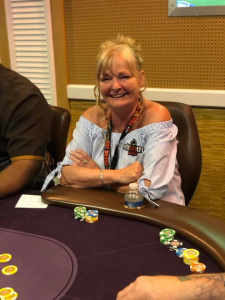 Tim tabled 10-4 to Eddie’s 10-8 and when the Kh hit the river the tournament was over and Tim Osborn was crowned the NEW UK Pub Poker Champion.